Process intensification (PI) is a process design philosophy aimed to improve process flexibility, product quality, speed to market and inherent safety, with a reduced environmental footprint. In the EU roadmap, PI is defined as a set of innovative principles applied in process and equipment design, which can bring significant benefits in terms of process and chain efficiency, lower capital and operating expenses, higher quality of products, less wastes and improved process safety. 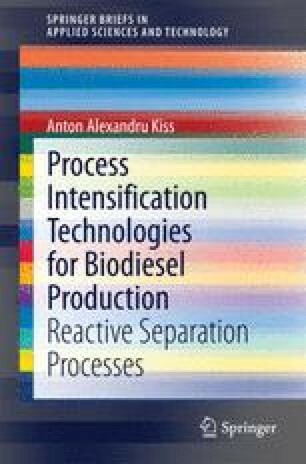 This chapter describes the concept of process intensification and the technologies based on process intensification, providing a general overview with an emphasis on the specific applications to the biodiesel production.